I have these Ann Taylor jeans in coral, turquoise and green and I think I will live in them all summer long- I'm obsessed to say the least. The J. Crew Perfect shirt really do have the right name, they are perfect in every way. My brother gave me this Gigi Clutch for Christmas and I love it. It goes with everything, holds all my necessities for a night out and is the perfect shade of orange. Asos has great accessories- I love this blue belt. These Orange stud earrings are a colorful alternative to classic diamond studs. It tends to get chilly at night when the sun goes down, this blue scarf would be lovely for those cool Summer nights. Oh what I would give for an Orange Hermès bracelet of my own. When I start my own business and finish my first big design project this will be the first present I buy myself- I can't wait for that day! So tell me, what are your favorite go-to colors? I will forever be obsessed with the Hermes bangle! Le sigh. Now this is an outfit I could wear...in fact, I was looking at those AT jeans online. Love it. They have really cute blue gingham shirts at old navy right now -- half the price and I think they fit nicer too! You have such amazing taste! I have an Hermes clic clak H braclet,and it is one of my favorite things!! Love your blog.. I want everything in this post! You have great taste! And I too can't wait for the day I get a Hermes click clack bracelet! 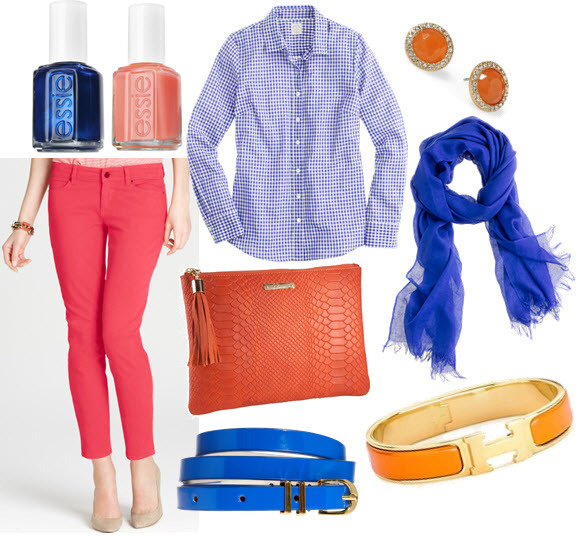 Orange and Blue are my favorites and I love seeing how you put them together. I am going to have to try the Tart Deco nail polish!! As for the Hermes bracelet ... maybe one day ... i still have kids to put through college!! Yellow and gray is one of my favs..it's my bedroom color scheme. Love that clutch! I have it and have gotten so many compliments on it!